Members of the Senate Energy and Natural Resources committee voted on Tuesday to push the controversial nomination of Bernard McNamee for Commissioner of the Federal Energy Regulatory Commission (FERC) to the full Senate, on a mostly party-line vote. Joe Manchin joined Republicans in voting for McNamee, 13-10, even in spite of a recent video that shows McNamee criticizing renewable energy and expressing strong support for the sole use of fossil fuels – as well as describing environmental advocacy as “tyranny.” This vote serves to underscore a continuing problem in Washington: that a nominee who, on the record, has showed significant bias toward the fossil fuel industry, is lauded and promoted by Senators to lead the very agency where he is expected to remain impartial. The 13 Senators who voted in the Committee to move McNamee’s nomination forward have taken a combined total of nearly $10 million from the fossil fuel industry – bought and paid for by an industry that accelerates the climate crisis and only cares about protecting their profits. It is evident that fossil fuel money is both crippling our democracy and destroying our climate, influencing the structural branches of government that regulate our nation’s infrastructure and energy supply. That works out to more than 8 times the dirty energy money taken by those voting in favor of McNamee’s nomination than the average of those voting against the clearly fossil-biased pick. Today’s vote moving McNamee’s nomination forward shows that the industry’s grip on Washington politics is still suffocating our democracy. 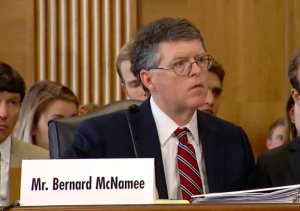 McNamee will go before the Senate next month for a full vote on his nomination, where we will have one more chance to push against the industry’s influence and prevent McNamee from becoming the next Commissioner of FERC. This nominee is a partisan advocate for fossil fuel use, in spite of the just released climate report re: global warming. This is madness exemplified, all in the name of profits.